Junk food, pollution, toxic chemicals have an adverse effect on the system, where harmful substances interfere with cellular function. Chronic illnesses are often a sign of toxic overload. Detoxification has an important role in better health and promoting a stronger immune system. It is best to use the Toxin Flush technique together with a supporting detox diet, and cleanses. The organs responsible for elimination of toxins are liver - see liver detox - kidneys - see kidney cleanse - colon, lungs, and skin. Be sure to drink plenty of water, to flush your system whenever you are triggering detox channels - meridians. Methods of detoxification include fasting - water fasting or juice fasting - and dietary changes. 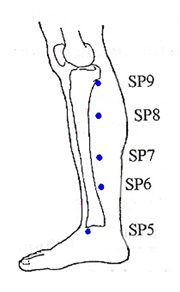 Together with these methods acupressure points can be used to accelerate and stimulate the cleansing process. Stand up and take your arms over your head while breathing in and stretch backwards as far as comfortable. Exhale as you bend forward, stretching your arms to the floor. Be a rag doll. Inhale as you stand back up. Bring your arms over your head and lean to the side, exhaling as you lean. Breathe in as you straighten up, and repeat on the other side. After this warm up, you're ready to begin the pressure-point routine. LR3 - Regulates and tonifies the liver, a major detoxifying organ. 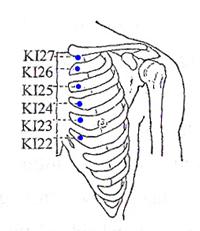 KI27 - Tonifies the kidneys - key detoxification organ. PC6 - Regulates stomach, heart and liver Qi. CV17 - Transforms Qi and clears the chest, which houses the upper burner of the Triple Warmer Meridian, allowing Qi to flow freely through the lungs. To balance the points, press each one with a deep, sustained pressure until you feel a change. 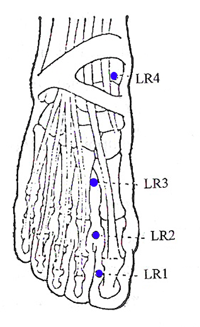 Then pulse pressure on the point for another while.